Devon for Europe is a local non party political campaign organisation committed to the United Kingdom remaining in the European Union as a full and active participant in shaping the EU’s future. We do not support any particular political party over any other one. We do not promote any political views over others except when it comes to the issue of Brexit. As part of Britain for Europe, we are a powerful voice for people from all walks of life, of all political outlooks (and none) who believe Britain’s best interests are served only by our country’s continued membership of the European Union. Join Devon for Europe in our campaign to Stop Brexit, there are many ways in which you can participate, from a flag wave, to helping out on a street stall, from writing to your MP to taking part in a national march. Talk to our friends, families, neighbours and colleagues about what we love about Europe and the EU, about all of the benefits we enjoy – peace, freedom of movement, social and environmental protections, clean seas and beaches, human and employment rights, an unparalleled free trade zone. Write to and meet our MPs. Regardless of whether they campaigned for “Leave” or “Remain” in the divisive EU referendum, their job is to represent the views of all of their constituents, and to act in the best interests of the country. We MUST make ourselves heard! 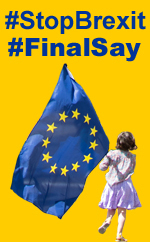 We believe that democracy is an ongoing process and we will use all democratic means available to ensure that Parliament gives the people a final say on the negotiated proposals for leaving the EU, with the option to remain included. In a democracy the people MUST be allowed to change theri minds. True democracy can only flourish with opposition. It is our democratic duty to oppose. Many MPs are deeply concerned by the extreme direction in which the government are taking our country. These MPs need us, the public, to encourage them to speak up for our future relationship with Europe. We need to show them we do care deeply about this unfolding disaster. They know that there is no better deal for Britain than the one we already have as a member of the European Union.